Did you know that Tri-State Community Health Center offers a sliding fee discount to individuals and families based on family size and income level? This is made possible through a federal grant intended to help reduce health care costs for people with no health insurance or limited income. 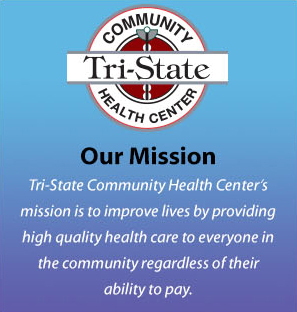 As a community-based, non-profit organization, Tri-State is committed to offering healthcare to all area residents regardless of their ability to pay. To see if you qualify for our Sliding Fee Scale Discount Program, please visit or call our Case Manager at each site. The Case Manager is available to meet with you to discuss the various options for meeting your needs.